The Immersion program is designed for children who already speak English at a high level of fluency. We maintain a very strict English-only policy, while making it fun and natural to speak English during camp, 24 hours a day. 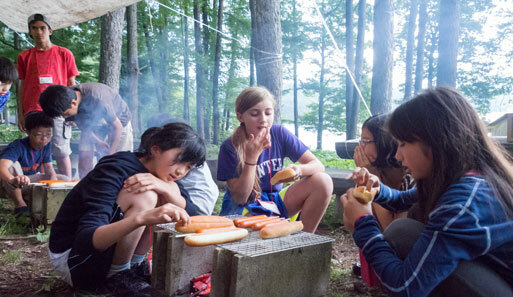 For Japanese returnees, bicultural children, and native English speakers, there’s no better way to enjoy a genuine North American camp experience—without the expensive plane ticket! We're often asked, "Do campers really speak English all the time?" The fact is, kids love the all-English environment. With encouragement from camp staff, even kids who have forgotten some of their English soon gain the confidence to speak up and be heard. Of course, bilingual staff are always nearby to support in an pinch. Returnee kids who have spent a long time living abroad can find it hard to fit in at an all-Japanese school. At English Adventure, kids can just be themselves. Many parents tell us their children love the open, international camp atmosphere. English Adventure camp staff come from all over the world and together create a unique international culture. 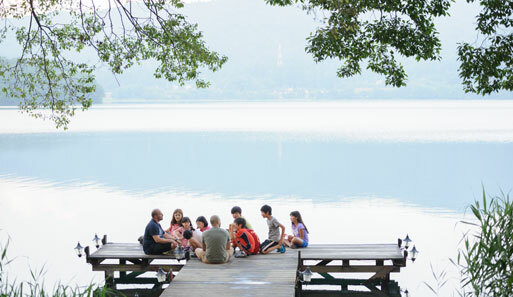 Campers experience this amazing diversity firsthand, gaining a deeper awareness of the greater world outside of Japan. Every day, campers interact with staff and learn how to respect and value their differences. American summer camp is about kids learning for themselves, trying new things, and becoming more independent. English Adventure's age-specific program design ensures that each camper gets the right level of excitement and fun. Camp staff are there to support campers as they take on new challenges and grow into leadership roles. For repeaters, coming back to camp means reconnecting with camp friends and building on shared experiences. Making memories to last a lifetime is one of the key reasons parents choose to send their campers to English Adventure year after year. We know that the 100% English environment of our Immersion Program is one of the reasons parents and campers choose English Adventure. We strictly require Immersion Program campers to speak ONLY English, throughout their time at camp. Before camp, please assist us by discussing our English Policy with your child, and express your expectations for him or her. 1) We will remind the child that our camp is 100% English, and ask him or her to speak only English. 2) If the child continues to speak Japanese, we will call home so that the parents can remind the child of their expectations. B. Ask their parents to pick them up from the campsite and take the camper home. We will not be able to provide a refund in either case. While this policy may seem strict, we are confident that you want your child to get the most from their camp experience and from your financial investment, and so do the parents of the other children at camp. Of course we understand that children may have forgotten some of their English, or may not know how to say something. In that case, we are happy to help them remember or learn what they want to say at any time. They can feel free to ask us anything. If they need to ask “how do I say りんご in English?” that much Japanese is acceptable at any time. If your child cannot yet maintain a round the clock 100% English environment, but is currently registered for an English Immersion camp, please contact us. We will help you select an English Challenge camp session that will be far more meaningful, educational, and enjoyable for your child.